The Business of Design Week(BODW) Forum, an annual design event organized by Hong Kong Design Center (HKDC), officially starts today (5th Dec) at Hong Kong Convention and Exhibition Center. Guests-of-Honour HM Queen of the Belgians and HKSAR Chief Executive Mr C Y Leung conducted the opening ceremony in the morning. In the morning sessions, one of Belgium’s most influential designers Charles Kaisin and RIBA Golden Lion award winner Sou Fujimoto shared their knowledge and insights. For the afternoon sessions, topics include Cities Driven by Design, Design for Experience, and Fashion & Design. 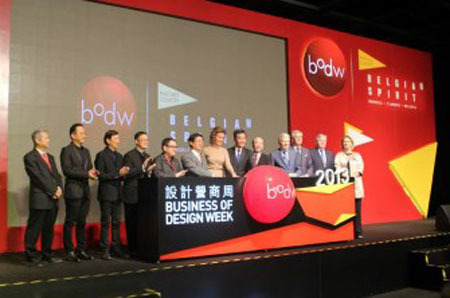 BODW is one of the Asian leading annual events on design, innovation and brands, and has been organized by the HKDC since 2002. The event has aimed to encourage businesses to unleash the power of design by focusing on the vital relationship and complex interplay between design and business. The Forum, to be held from 5th to 7th, with a wide array of concurrent conferences and exhibitions, provides a significant platform for designers and business leaders to exchange ideas. For this year edition, featuring Belgium as Partner Country, more than 20 key designers from the country, such as Charles Kaisin, famous fashion designer Marina Yee and furniture designer Xavier Lust, attend the Forum. In addition, other international renowned designers are joining as well. In addition to the three days Forum, special programs taking place during BODW from December 2-7 include DETOUR, the BrandAsia Forum, the DesignEd Asia Conference, the Technology for Design Seminar, as well as the annual Hong Kong Design Centre (HKDC) Awards Gala Dinner.